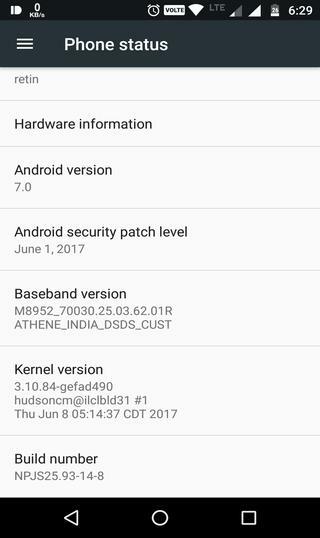 Lenovo-Moto is now rolling out the June 1, 2017, security patch to its mid-range G-line former flagship duo- the Moto G4 and G4 Plus. A few days ago, we have already posted, where the June security patch was being pushed to the Moto G4(Plus) devices in Brazil. Today, a broader rollout is happening for India as well. We have received tips from users reporting of the update being pushed to their devices. 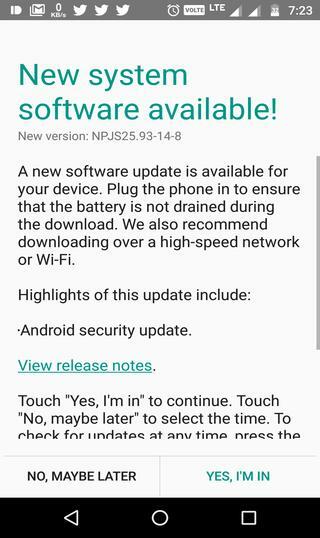 The update comes as an OTA(Over-The-Air) file, it can only be installed on the Moto G4 devices running the stock Android 7.0 Nougat with build NPJS25.93-14-4. Following is the screenshot that shows the update is now live. The update seeds a new firmware, where the build number has been changed to NPJS25.93-14-8 from NPJS25.93-14-4. The full changelog for the update is not mentioned, moreover, the security patch is not the latest but updating the same will improve device stability and do the minor bug fixes. The OTA is small in size, it weighs around 55.5MB and you can either download it on your mobile data or use a Wi-Fi network. Meanwhile, if you have not received the update on your phone you can follow these steps in the tutorial given below. How to Capture the OTA for Moto G4 (Plus) with the NPJS25.93-14-8 build? To do so, go to the phone settings> about phone section> and check for system updates. If you are running the stock Android 7.0, you shall receive the same. It is always advised to download the updates over a Wi-Fi network. Also, keep your battery charged above 75% to ensure a smooth installation. If you face any issues while downloading the package, reach out to us via the comments section given below.